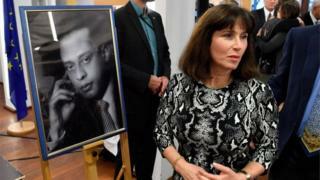 The only Arab to be awarded Israel's highest honour for saving Jews during the Nazi Holocaust has posthumously received his award. Egyptian doctor Mohamed Helmy hid a young Jewish woman and helped her family in Berlin, where he lived and had worked before World War Two. A descendant of Dr Helmy, who died in 1982, was presented with the award at a ceremony in the city. Some 70 Muslims are among 26,500 non-Jews recognised by Israel as saviours. Mohamed Helmy had settled in Berlin in 1922, where he studied medicine and worked at a hospital. He himself suffered racial discrimination under the Nazis, lost his job and was twice arrested. As persecution of Germany's Jews intensified, Dr Helmy provided a hiding place for one of his patients, 21-year-old Anna Boros, at a property he owned in the city. He managed to shelter her from the Gestapo and provide assistance to her mother, stepfather and grandmother until the end of the war in 1945. Later on, Anna Boros, wrote: "Dr Helmy did everything for me out of the generosity of his heart, and I will be grateful to him for all eternity." Dr Helmy was recognised by Yad Vashem - Israel's national Holocaust Memorial institution - as Righteous Among the Nations in 2013. His award was presented to his great-nephew, Nasser Kotby - also a doctor - at the German foreign ministry in Berlin. Anna Boros's daughter also came from New York to honour him at the event.